Heavy snow has led to power cuts and disrupted air, rail and road travel in many parts of the UK. 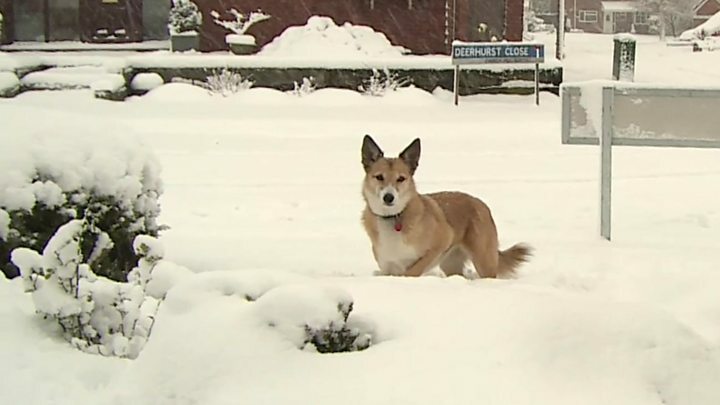 The deepest snow recorded was 30cm (12in) in Sennybridge, near Brecon, while High Wycombe saw 17cm. Snow is forecast to remain in Northern Ireland and Scotland but give way to icy conditions overnight elsewhere. 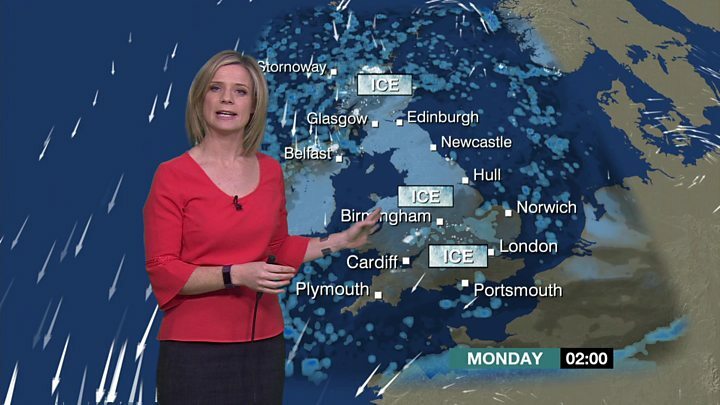 Met Office yellow "be aware" warnings for ice affect England and Wales. Hundreds of schools across England and Wales will be closed on Monday. Flights have been disrupted at several airports, including Heathrow, where snowploughs were used to clear the runways. Heathrow remains open but says the de-icing of aircraft is resulting in some delays and cancellations. But passengers flying into the airport have also said they are experiencing delays in disembarking from planes. Electricity supplier SSE said about 5,400 homes in Oxfordshire, Berkshire and Wiltshire remain without power after snow and wind saw tree branches coming into contact with overhead cables. Its engineers are working to carry out repairs but because of "continuing issues with access to fault locations" about 800 homes in Oxfordshire will remain without power overnight. The company is serving free hot food and drinks to affected customers. Across the Midland, South West England and Wales, about 9,000 properties served by Western Power Distribution were affected by power cuts. The company says it is working to restore power overnight. Buckinghamshire County Council and Shropshire Council say the majority of their schools will be closed on Monday because of the snow. There have been similar announcements in Denbighshire, Birmingham, Gloucestershire, Worcestershire, Oxfordshire and Northamptonshire, while Hertfordshire County Council says some of its schools have taken the decision to shut. Meanwhile, drivers have been advised by police to avoid non-essential journeys. Temperatures reached lows of -10C (14F) in some parts of Scotland and Wales, falling to as low as -14C (6.8F) in isolated rural areas. An amber warning for snow was extended on Sunday to cover Gloucestershire, Wiltshire, Oxfordshire, Buckinghamshire, Hertfordshire and Essex but areas including Liverpool and South Yorkshire were downgraded to a yellow "be aware" warning. What do yellow, red and amber mean? The Met Office says ice is likely to be the "main hazard" over the next 24 hours as it issued a further yellow "be aware" warning for snow and ice in Scotland and Northern Ireland. It warned of icy surfaces on Monday in Wales and in the Midlands, East of England, London and the South East, the North West, South West, and Yorkshire. Overnight temperatures into Monday are forecast to be between -1C and 1C in built-up areas but as low as -10C in the countryside. "Ice is expected to form across many places overnight into Monday morning. Some injuries are likely from slips and falls on icy surfaces as well as icy patches on some untreated roads, pavements and cycle paths," the Met Office said. "As well as this lying snow from Sunday will continue to be a hazard leading to longer and potentially hazardous journeys." It said some snow may fall over parts of Kent, Sussex, Surrey and Hampshire on Monday morning but it was not expected to settle.